Not as well-known as some of the larger residential areas, Puerto del Almendro is a peaceful spot tucked into the folds of gently rising foothills at the base of the Serranía de Ronda mountain range. It lays at the beginning of the Ronda road, with beyond exclusive residential areas such as Monte Halcones and Los Arqueros, country clubs such as El Madroñal and La Zagaleta, and after that the open scenery of the mountains. Though just a few minutes removed from golf courses, beaches, Puerto Banús, the lively little town of San Pedro Alcántara and the pretty village of Benahavís, under which it falls, Puerto del Almendro enjoys enough elevation to afford it fantastic sea views across country scenery down along golf courses and leafy residential zones to the beaches that hug the Mediterranean shoreline. On clear days you can see across to Gibraltar and North Africa. Ensconced within the greenery of wooded hillsides, this is a very private but also central Benahavis urbanisation that is made up of both apartments and villas. The lack of passing traffic ensures peace, privacy and tranquillity, while the natural slope of the land and established nature guarantees the stunning south-facing sea views of the properties in Puerto del Almendro are protected. Among the fine homes found here attractive apartment complexes such as these delightful two-bedroom apartments. Set within in a small development of just ten apartments, they offer up to 170m2 of space within a complex that features a swimming pool, lush gardens and a spa with indoor pool and gym. This charming country villa featuring contemporary comfort and timeless style, refinement and good taste is typical of the villas for sale in Puerto del Almendro. Offering space, beautiful gardens, gorgeous views and rustic refinement on the doorstep of Marbella, it represents a real estate jewel that seldom comes up for sale but is quickly snapped up when it does. Also this classic style villa with amazing sea and mountain views, set within a gated community. For those in the know, Puerto del Almendro is one of the most desirable areas in this part of Marbella. 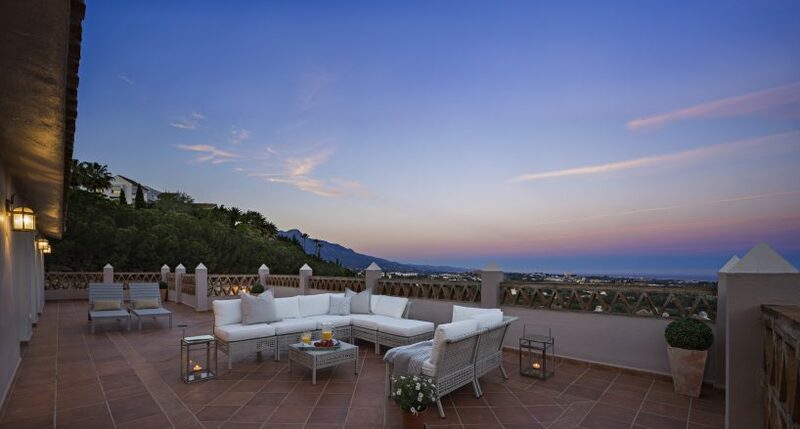 If you are interested in knowing more about property for sale in Puerto del Almendro, Benahavis, please contact the Marbella luxury real estate specialists Diana Morales Properties | Knight Frank.